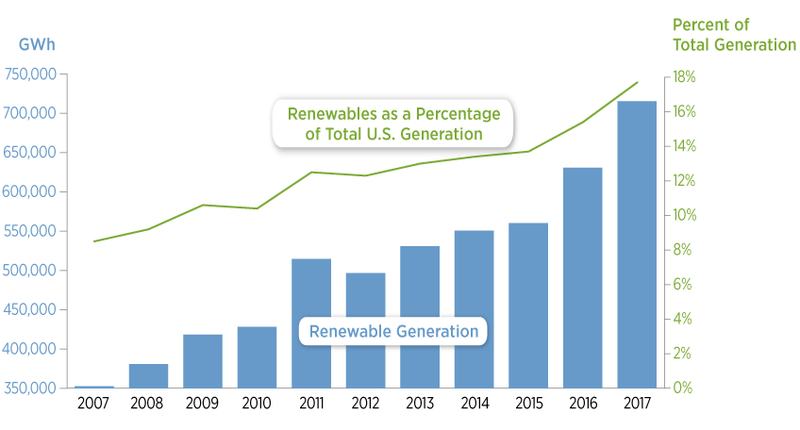 by Brianna Crandall — March 20, 2019 — US renewable electricity grew to 19.7% of total installed capacity and 17.7% of total electricity generation in 2017, compared to 18.3% of total installed capacity and 15.6% of total electricity generation in 2016, according to the 2017 Renewable Energy Data Book, now in its 10th edition. Installed global renewable electricity capacity also continued to increase in 2017, representing 32.2% of total capacity worldwide. Graphic from the 2017 Renewable Energy Data Book highlights sustained growth in US renewable electricity generation since 2007. Image courtesy DOE/NREL. Click image to enlarge. Published annually by the US Department of Energy’s (DOE’s) National Renewable Energy Laboratory (NREL) on behalf of DOE’s Office of Energy Efficiency and Renewable Energy, the Renewable Energy Data Book presents US and global energy statistics compiled from numerous data sources, and includes renewable electricity generation, renewable energy development, clean energy investments, and technology-specific data. Produced by NREL’s Strategic Energy Analysis Center, the Data Book makes a wealth of renewable energy data accessible to a broad audience ranging from the interested public to the decision-maker. This year’s edition is the first to include data and trends for electric vehicles (EVs) and energy storage technologies, in addition to data-centric charts for wind, solar, hydropower and alternative fuels. Since the first Data Book release 10 years ago, we’ve seen US renewable electricity generation grow from 8.5% of total generation in 2007 to 17.7% in 2017 — more than doubling its share of the generation mix — with generation from solar and wind increasing by a factor of 10. This year, we expanded the Data Book to include information on emerging technologies including energy storage and electric vehicles, providing additional insights analysts, investors, and policymakers can use to assess US and global renewable energy deployment and industry trends. In 2017, renewable electricity accounted for 60% of US electricity capacity additions, compared to 67% in 2016. US wind capacity increased by more than 8.3% (6.8 gigawatts) compared to 2016, accounting for more than 43% of renewable electricity capacity installed. Wind represented 7.5% of cumulative US installed electrical capacity in 2017. US solar electricity capacity increased by 26% (8.9 gigawatts) compared to 2016, accounting for more than 54% of newly installed renewable electricity capacity in 2017. Solar represented 3.7% of cumulative US installed electrical capacity in 2017. The Renewable Energy Data Book also includes state- and region-specific energy data and trends, along with statistics on clean energy investments and development worldwide. Is your state considering a clean energy law? See what California — now the world’s fifth-largest economy — just passed September 28, 2018 In "Regulations and Government"
Find out how many US corporations are buying off-site, large-scale renewable energy May 25, 2018 In "Surveys and Trends"
Get a better grasp of the changing energy sector, with this new industry primer July 30, 2018 In "Products and Services » Publications"